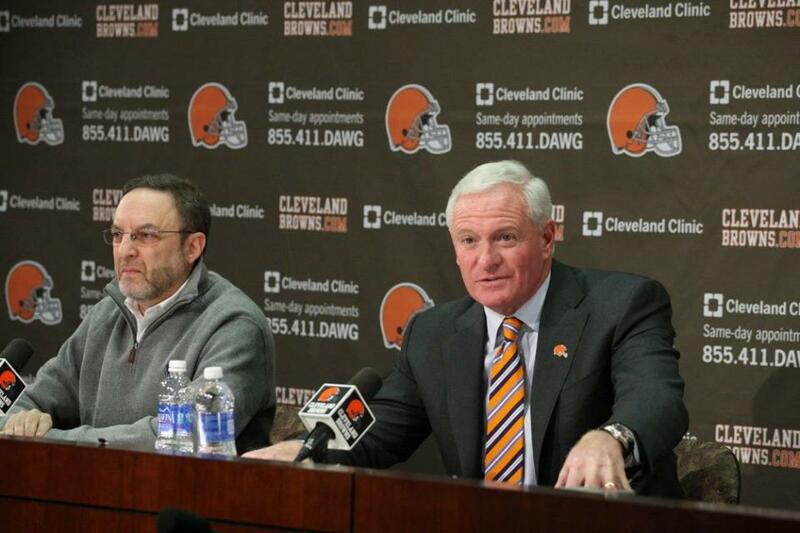 When Jimmy Haslam bought the Cleveland Browns and brought Joe Banner to town to run the organization, the duo talked about how they were going into this with eyes wide open. We were a bit skeptical at the time if that was true or not, because you really have to be here to understand the scrutiny placed on the Browns – Cleveland’s only sports team that is a topic of conversation 365 days a year. But if Haslam, Banner and the rest of the crew in Berea didn’t realize what they were getting themselves into, the past month certainly has driven the point home. Ever since the Browns decided to fire head coach Rob Chudzinski after just one season on the job the franchise has been criticized in a way that we haven’t seen since the Bill Belichick-era in the early 1990s. Being the focal point of everyone’s attention has its benefits, obviously. At one point all the Browns basically had to hang up a sign saying “Game Today” and the fans would flock to the stadium. A decade of losing has taken its toll on attendance, but the Browns still bring in enough fans on a weekly basis that they don’t have to worry about keeping the lights on. For example, one area where the Browns have trailed the Indians and Cavs is the ability to do things that add perceived value but don’t equate to putting a better product on the field or court. The Indians roll out a Social Suite and fans ignore that the team hasn’t had consecutive winning seasons in 13 years and that their may be a problem with Chief Wahoo. The Cavs send someone to the Sloan Sports Analytics Conference, distracting fans from that fact that since the start of the 2010-11 season the Cavs have been every bit as bad as the Browns, or that Dan Gilbert has become every bit as distracted by the Horseshoe Casino as Randy Lerner ever was with Aston Villa. The Browns have had a big hand in this mess – firing a coach after just one season can’t help anyone’s reputation – and we will never understand why they would hire Mike Lombardi when not a single other NFL team would go anywhere near him. But that doesn’t mean that everything the team does goes wrong. It’s irrelevant how the search for the new head coach went – either in reality or how it was perceived – because the Browns may have landed the right guy in Mike Pettine. And while we have our fears and concerns about Lombardi, that check is balanced by the fact that the Browns were smart enough to hire Ray Farmer – someone that other teams actually do want to hire away from the team. Farmer had the chance to leave Cleveland for Miami, but realized that things may not be so bad here in town. It is easy enough to be cynical and decide that Farmer is just being a good company man, but his assessment of the situation in Berea was echoed by John Wooten, chairman of the Fritz Pollard Alliance and a former Browns player. Even when the Browns try to do things better, people want to try and create an ulterior motive behind the move. Take Banner and the media, for example. For three years, we heard media members complain that they always had to talk to general manager Tom Heckert, demanding that they be allowed to speak to team president Mike Holmgren. When Banner took over, he laid out some simple guidelines – he would never willingly lie when asked a question and he would be the voice of the franchise. As far as we can tell, he’s stuck to the first guideline and has certainly stuck to the second one. But that isn’t good enough for some, as demands continue that Lombardi be made available to the media and the fact that he isn’t must mean the Browns are hiding something. Again, the Browns find themselves in a battle over perception. Banner’s right; he maybe shouldn’t have gone on record saying it, but he’s right. This is one of those Only in Cleveland moments that continually make us scratch our heads. When Haslam bought the team, we thought the same thing we did every time there has been a regime change with the Browns. The new guys can’t be held accountable for the mistakes of the past, but they are responsible for fixing it. The biggest way they can fix it is by winning, preferably sooner rather than later. We have our doubts about some of the pieces the team has in place – we’re on the fence about Kyle Shanahan as offensive coordinator, for example – but that’s based on actual performance rather than perceived value. The Browns can keep on winning the little battles over the way they are viewed by doing things like hiring Pettine and Farmer, or even pointing out some of the silliness surrounding the organization of the team. But talking about the organization being good is not the same as actually being good. The only surefire way to change perceptions is to finally starting winning where it matters – on the field.